This is a fabulous picture. Love the play of lines and the sun.. THIS is a railway temple...Strange I have been here a few times, maybe I am to eager to get out of the many people and never had time to look around. Was this after our day in Bristol?? This is superb Bill! And very nicely twiddled too. A cracking shot, Bill, in terms of its composition with the curves of the roof and the tracks giving a wonderful perspective. I'd be interested to see this in colour at some point to see more of the detail on the platform opposite. I declare! And to think I have actually been there. Bill Phillips: Indeed you have. A wonderful station and so nice you meet you there! It looks quite industrial for a temple, Bill...I suppose this is where the Christians were processed into sardine tins before being shipped to the middle east at the time of the crusades? I rather like this photo of BTM Bill. I don't know why because it's rubbish really. Says a lot about me I spose. Welcome to the Black Monday Society. Oooh... Very nicely done for Mono Monday. Quite a picture you have here. Love the lines and vanishing point. 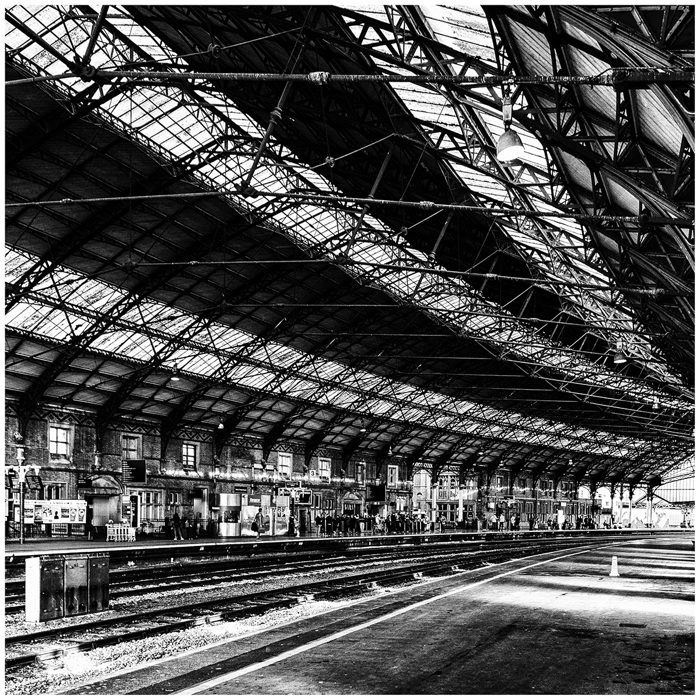 A station on a par with York for having such a lovely roof structure. wow, this is a fantastic shot. after looking at your presentation, i cannot imagine it in colour, Bill. Bill Phillips: Thanks very much Sir! I see, I had not realised that.